The first thing you need to know: bed sores are serious. Bed sores, also known as pressure ulcers or decubitis ulcers, are not scratches or scrapes. They are not “surface” injuries or blemishes. They are a breakdown of the body’s largest organ and they are dangerous gaps in the body’s first line of defense against infection and life-threatening disease. Think of your skin as a suit of armor. Every weak point in that armor is an opportunity for infection to threaten your internal health. While natural openings in the skin (the mouth, eyes, nose, etc.) have built-in defenses against disease, bed sores are like an open door, a gap in your armor through which infection can pass freely. Bedsores can lead to severe medical complications, including bone and blood infections, infectious arthritis, holes below the wound that burrow into bone or deeper tissues, and scar carcinoma, a form of cancer that develops in scar tissue. Bottom line — bed sores can kill, or make patients very sick. Patients and caregivers have to understand this in order to protect patient health. Bedsores are injuries to the skin and underlying tissue, caused by pressure. Being unable to stand, walk, and move subjects certain areas of the skin to prolonged pressure that a fully mobile person never experiences. A convalescent patient’s body weight presses the skin against the surface of a bed or chair, cutting off blood supply and literally causing the skin cells to die. The human body is simply not designed to stay still. Unfortunately, sometimes people are confined by disease or injury to a bed or wheelchair, or a combination of both. Our skin does not have any ability to adapt to this. Therefore, patients must be protected from the unique dangers presented by prolonged lack of movement. In the United States, approximately 9% of all hospitalized patients will develop bed sores. An estimated 3%-14% of home care patients will develop them, as well as 3%-12% of nursing home residents. Importantly, patients transferred from hospitals to nursing homes are particularly vulnerable, with 10%-35% reported to suffer from bed sores. It doesn’t take much pressure to create bedsores. Pressure less than 25% of the normal pressure of human weight on a mattress can lead to bedsores. Waking movement, along with the natural movement in our sleep (all that tossing and turning is good for something!) is enough to prevent bedsores for able-bodies people. Patients confined to beds or chairs aren’t so lucky. Shearing and friction of the Skin: Shearing and friction occur when two surfaces move laterally against each other— like skin against a mattress. This causes the skin to stretch, kinking the blood vessels and impairing circulation. Shearing and friction can occur when a bedridden patient is dragged or slid across sheets, or when the head of the bed is raised more than 30 degrees, which increases shearing forces over the lower back and tailbone. Moisture on the Skin: Wetness from perspiration, urine, or feces can soften skin. This makes the skin more vulnerable to pressure. Because of this, incontinent patients unable to control their bladders or bowels are at a higher risk of developing bedsores. Decreased Sensation: Bedsores are more common in patients with spinal cord injuries and other neurological problems that decrease their ability to feel pain or discomfort. Without the warning signs of pain, the patient cannot feel the effects of prolonged pressure on the skin, leaving the problem unaddressed. Circulatory Problems: People with atherosclerosis, diabetes-related circulatory issues, or localized swelling (edema) can develop bedsores. Because the blood flow in their skin is already decreased, the effects of pressure are exacerbated. Anemic patients are also at risk, because their blood cannot carry enough oxygen to skin cells despite otherwise normal circulation. Poor Nutrition: Studies show that bedsores are more likely to develop in patients who lack enough protein, vitamin C, vitamin E, calcium or zinc. Age: Elderly patients, especially those over 85, are more likely to develop bedsores since skin becomes thinner with age. Also, as we age, fat tends to shift away from the body surface, where it acts as a cushion, leaving the skin even more vulnerable. Bed sores are classified into 4 stages, based on the severity of skin damage. WIth prolonged pressure, the skin develops ulcers. At first, the skin shows redness. Without relief, that redness progresses to blisters, followed by open sores. In severe cases, the damage can extend through the skin, creating deep craters that expose muscle or even bone. Stage I White or light-skinned patients develop patches of red skin. To verify the presence of a bed sore, press the skin with a finger; if the skin does not turn white, a bed sore is present. In people with darker skin, the patch may be red, purple, or blue and may be more difficult to detect. The skin may be tender or itchy, and may feel either warm or cold and firm. Stage II The injured skin blisters or develops an open sore or abrasion. At this stage, the sore does does not yet extend through the full thickness of the skin. There may be a surrounding area of red or purple discoloration, mild swelling and some oozing. Stage III The ulcer becomes a crater that penetrates below the skin surface. Needless to say, this is where bed sores become more dangerous. Stage IV The crater deepens and reaches into muscle, bone, tendon or joint. Because broken skin is a prime spot for bacteria, bedsores are extremely vulnerable to infection. Like any organ, the skin needs to be taken care of. Specifically, it needs blood and oxygen to stay healthy. When the skin is deprived of these by sustained pressure, bed sores start to form. In that case, only the right tools and treatments can help. That’s where support surfaces come in. You may have heard about “support surfaces.” This is a catch-all term for mattresses and other surfaces that provide variable levels of support, vastly reducing the pressure on different areas of the skin. Support surfaces include medical air mattress, gel mattresses, and “alternating pressure” air mattresses. Many patients and caregivers are overwhelmed by the sheer variety of support surfaces. With the exception of professional caregivers, most people only find themselves faced with caring for an incapacitated person once or twice in their lifetime — so it’s understandable to be a little lost when faced with so much information, and so many choices. The National Pressure Ulcer Advisory Panel (NPUAP) defines a support surface as “A specialized device for pressure redistribution designed for management of tissue loads, micro-climate, and/or therapeutic functions.” In layman’s terms, a support surface is a medical device designed to take the pressure, heat, and moisture off the areas of skin prone to bedsores, like bony prominences. Medical air mattresses are designed to provide a proper support surface in order to help prevent and heal bed sores. They usually accomplish this by redistributing the pressure to other parts of the body, so the vulnerable area gets a regular “break” from pressure. Most clinical guidelines recommend relieving pressure by repositioning the body every 2 hours while in bed, and every 15 minutes while seated. Support surfaces use a variety of methods to achieve or simulate this repositioning. Support surfaces come in many shapes and forms, designed to address different needs and bedsore-causing conditions. Each of these support surfaces come in many different variations. They can be affordable, or wildly expensive, depending on their design and materials. They also range widely in effectiveness and comfort, depending on the patient’s condition and preferences. Choosing the right support surface is key to maximizing patient comfort and reducing or eliminating bedsores. As you encounter different support surface products, it’s important to understand the medical terminology involved in order to find the right device for your needs. Alternating pressure mattress systems shift pressure from one part of the body to another, using air cells that inflate and deflate. By alternating the areas of firmness and softness, different areas of the skin are relieved in turn. These medical mattresses have areas (zones) designed to accommodate the heavier and lighter parts of the body. The air pressure distribution reflects where body weight puts the most pressure on the skin. This feature is primarily for treating respiratory complications, but also redistributes pressure. The mattress literally turns the patient by folding lengthwise. Shear is a specific kind of pressure, generated when two surfaces shift against each other in opposite directions. Shear injuries may not be visible, and are often deep in the tissue. For example, a patient with their head elevated may slide downwards. While the bones and interior tissue move down, the top layer of skin remains in place against the mattress, causing opposing lateral pressure. 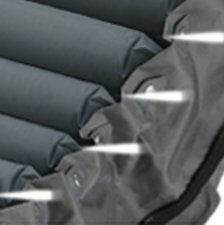 These medical air mattresses have an extra “backup” layer of air cells that remain inflated, even during a power outage. Typically the top layer of cells does the alternating, while the bottom maintains a consistent air pressure. These systems allow a stream of air, generally from a blower, through tiny perforations in the air cells. This steady airflow helps regulate the “microclimate” of the skin, reducing heat and moisture that can exacerbate bedsores. This feature rapidly hyper-inflates the air cells, making it easy to turn or reposition patients. It’s also important to use this feature when the patient gets in or out of bed, to protect the air cells and prevent breakage. Pulsation is essentially a more rapid version of alternating pressure, in which the pressure is alternated much more quickly and frequently, having a massage-like effect. Immersion is the depth into which the patient’s body can sink into the support surface. More or less immersion may be required to maintain patient comfort. Envelopment refers to the support surface’s ability to conform to the shape of the patient. A blower allows air to escape the support surface, better managing the skin’s “microclimate,” and is the defining feature of a Low Air Loss mattress. A compressor or pump is the standard air source, and is less effective in managing heat and moisture on the skin. Made of gel or foam, these more simple support surfaces can be placed on top of a standard mattress for added support. This feature, often used in hospitals or other settings with frequent visitors, locks the settings on an alternating pressure mattress to prevent tampering. As you research Google through the hundreds of hospital bed equipment for sale online, make sure that whatever you choose fits the needs of the patient. Get to know the product and its features before buying, so that you can form an appropriate care plan. With some basic knowledge, you can make informed decisions that result in relief for the patient, and peace of mind for you.